In the beginning, as regular Bible readers will be well aware, was the word. Back before the airbrushed images of saints and sacred hearts, before the Sistine Chapel, before the Second Council of Nicaea had managed to convince themselves that iconography differed from idolatry, before all that there was the word. The basis of the Judaeo-Christian tradition is written, not pictorial. The word. Or, as it is in Greek, logos. 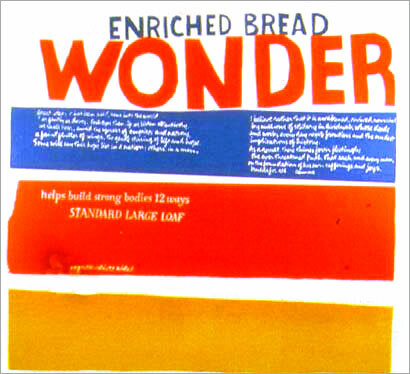 Sister Corita Kent, head of the art department at Immaculate Heart College in Los Angeles during the 1950s and 1960s, was inordinately interested in logos. Bombarded on all sides by the slogans and brand names of mid-century California, she found in them, perhaps unexpectedly, an affirmation that the divine word permeates every aspect of life. Seeing a loaf of spongy, mass-market Wonder Bread, she would be put in mind of the Eucharist; the name of the supermarket in which it was on sale, Safeway, would suggest the path to salvation. Much of the art that she produced was based on this concept of everyday revelation. 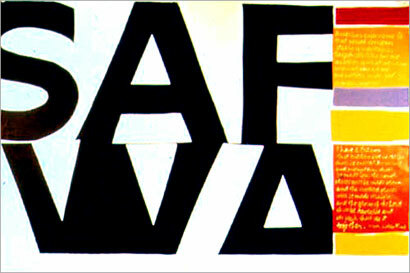 She avoided the visual representations of faith that one might expect from a Catholic nun, in favour of graphics in acid colours that evoked spiritual messages by taking words out of their commercial context – for example, a car dealer’s slogan reading “See the man who can save you the most.” The screen print was her medium of choice, as it was mass-produced and affordable, thereby spreading the message as widely as possible. But how is this co-opting of supermarket culture any different to those trite posters one sees outside evangelical churches saying “A God is for life, not just for Christmas”? The answer is in the execution. Sister Corita’s letterforms are treated almost as abstract images, waving and rippling as if viewed underwater. (She would achieve this effect by photographing the words on crumpled paper before screen-printing the results.) And Corita was very much in tune with the Pop Art aesthetics of the 1960s. 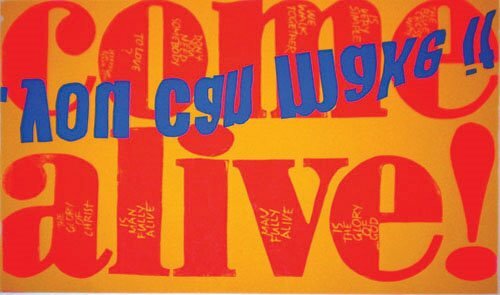 Her use of Dayglo colours and factory-line methods inevitably bring to mind Warhol; the iconic use of words – which often break, unhyphenated, across lines – evokes Robert Indiana; even her distinctive handwriting is reminiscent of that of the graphic designer Alan Fletcher. Indeed, that very handwriting became so intrinsically linked with uplifting pop spirituality that it was reworked (without her permission) into a font for Hallmark Cards. It is not difficult to see this as a fitting tribute, given that Sister Corita’s work, for all that it used the trappings of the counterculture, was really about over-the-counter culture. First published in World of Interiors issue 295. Reproduced with permission.